Some of biggest and best classic musicals touring the UK visit Bradford including: Calamity Jane, Anything Goes and Oklahoma. The Dance Consortium presents Cirque Éloize, a world class leader of contemporary circus. There are compelling dramas from the National Theatre and the Touring Consortium Theatre Company, a gothic fairytale from dance royalty Matthew Bourne and plenty of Yorkshire wit in firm favourite The Full Monty. 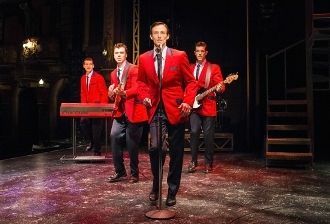 Plus, If you are in the mood for a party, you can dance the night away with the multi-award winning Jersey Boys or take a trip back to 1979 with Saturday Night Fever. There’s also plenty to keep you and your family entertained at our other venues this spring. With children’s classics The Tiger Who Came to Tea, Sooty and The Cat in the Hat and great tributes with King of Pop – The Legend Continues, Abba Mania, Born This Way – The Lady GaGa Experience and One Night of Elvis at St George’s Hall. The Studio is the place to be for comedy with brand-new comedy nights Laugh Out Loud Comedy Club acts include Tom Stade and Allyson Smith. We also welcome top stand-ups Stephen K Amos, Alun Cochrane and Romesh Ranganathan joined by Suzi Ruffell. Over at our Ilkley venue King’s Hall we present a variety of great shows including; Claire Martin & Ray Gelato’s A Swinging Affair, Michael Portillo - Life: A Game of Two Halves and Joe Longthorne in Concert. There is still time to book for West Yorkshire’s biggest Panto Snow White and the Seven Dwarfs, which opens on Saturday 13 December starring Panto King Billy Pearce and X-Factor winner Joe McElderry. "As we leave a very special year behind (the Alhambra Theatre's 100th anniversary), we're looking ahead to an equally exciting 2015 for Bradford Theatres. St George's Hall has been successful and we begin work to prepare for round two of the process. St George’s Hall continues to host a diverse and vibrant range of entertainment and spring is no exception: from ballet to Sooty there’s something for everyone! Theatre Company (A View From the Bridge). Some of the best touring musicals will be gracing the Alhambra stage throughout 2015 – keep checking the website to find out more! You still have time to book for this year's panto, Snow White & The Seven Dwarfs, and don’t forget all those extras your friends and family may enjoy as festive gifts. You can now also upgrade your booking for an Alhambra Theatre show with a VIP package and have access to the newly refurbished Laidler Lounge. I look forward to welcoming you, your friends and family to Bradford Theatres during 2015."